It sounds like a belated April Fools&apos; joke, but we assure you it&apos;s not. For two weeks French artist Abraham Poincheval will be living inside the hollowed-out carcass of a taxidermied bear and live streaming the entire experience. His artistic performance and personal choice yields many predictable questions: What? Why? Are you serious? What does that even mean? Is that even art? With regards to the last question, Poincheval certainly thinks so and has repeatedly engaged in performance and installation work that has him living in confined spaces for long periods of time, often also filming the experience. In 2009 he preformed a seven-day piece called "604,800 Seconds," in which he spent a week reading in a specially dug hole underneath a bookstore — so small he could barely sit or stand up — that was then covered by a boulder to eliminate any infiltration of natural light. In 2008, he teamed up with artist Laurent Tixador to travel underground through a closed tunnel, digging a small hole in front of them and then sealing it up behind them. 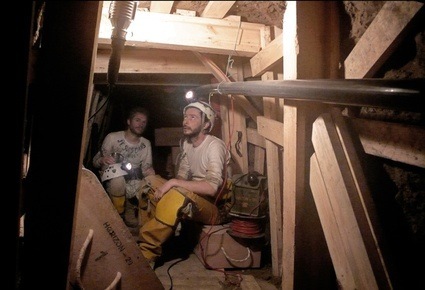 They spent 20 days in the tunnel, calling the project "Horizon Moins 20" and equating the experience to traveling like moles. "Horizon Moins 20" is similar to Poincheval&apos;s ongoing bear project, not just in its physical confinement but also in its appreciation for the animal experience. The press release for Poincheval&apos;s installation, which is ongoing until April 13 at the Musee de la Chasse et de la Nature in Paris, states Poincheval is undertaking the experience due to a "need to become one with such an animal." The announcement takes it even further, saying "the transcendence between man and bear endures since the dawn of time. A profound symbolism has existed since the prehistory, as symbolism that is still gripping the Western world&apos;s imagination today." For the claustrophobic among us, Poincheval&apos;s work is anxiety-inducing, but for the curious among us, it is also thought-provoking. He is enduring extreme physical discomfort for the purity of an artistic experience, and through his livestream he&apos;s inviting the world to experience it with him — plus we never have to get inside the bear.